Isolate sensitive analytical balances and other instruments from disturbing variations. Economical space saving alternative to full size balance tables. Polished surface resists scratches and chemical attack. Molded from dense black & white terrazzo. Four Vibro-Absorber™ cushions and neoprene feet. Supports up to 16kg (35 lbs). 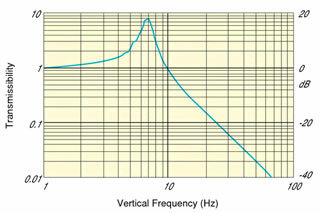 VIP Series 320 isolation technology is superior to air technology. 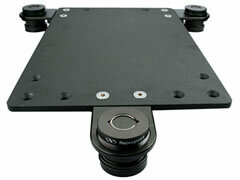 First, these vibration isolation platforms are passive, mechanical and maintenance free. There are no air hoses or supporting hardware required. Second, Vistek bearings isolate effectively for the horizontal and vertical vibration components. The superior performance of the Vistek bearings in all six degrees of freedom makes this isolation platform the best choice for eliminating unwanted vibrations. Virtually any type of scientific instrument may be positioned on the Series 320 Vibration Isolation Platform. 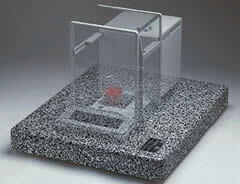 Units such as microscopes, hardness testers, measuring devices, digital imaging systems, AFMs, and Analytical balances are all applications for a bench top or tabletop platform. Standard sizes are 12" x 18", 18" x 24", and 24" x 30", for general use. Custom shapes, sizes and colors are available on request. 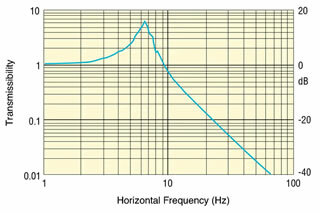 Transmissibility Curve for the VIP Series 320 1/6th Hertz Vibration Isolation Bearing. 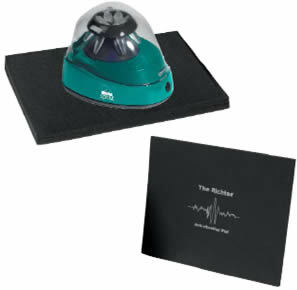 Cost Effective - Inexpensively dampens vibrations from lab equipment. Non-Slip - Creates a stable surface that will keep equipment in place. Versatile - Fits a variety of bench-top vortexes, shakers, rockers and microscopes. Portable- Small, lightweight design makes transportation easy. Configurable - Pads can be stacked for heavier units or laid side-by-side for larger equipment.